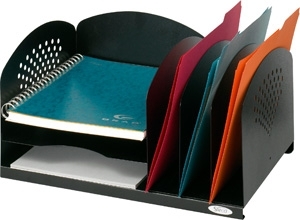 This steel desk organizer has three horizontal compartments to fit letter-size documents. The three vertical sections on right side fit file folders and small binders. Durable powder coat finish, pads to protect desk top surface.